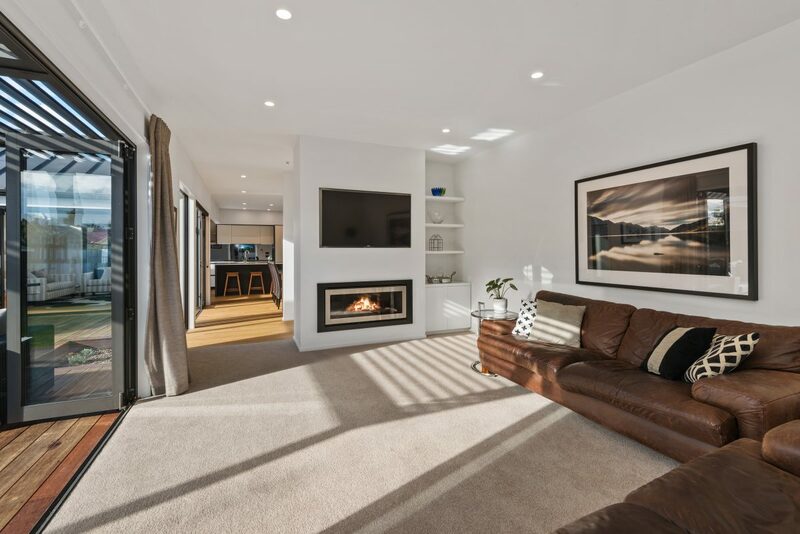 Bennett Street 2 | Fleetwood Construction Ltd.
Building a spacious family home within the busy Christchurch suburb of Papanui is a challenge for any builder. By working closely with our clients and their architect, we came up with a smart design that made the most of the space available. 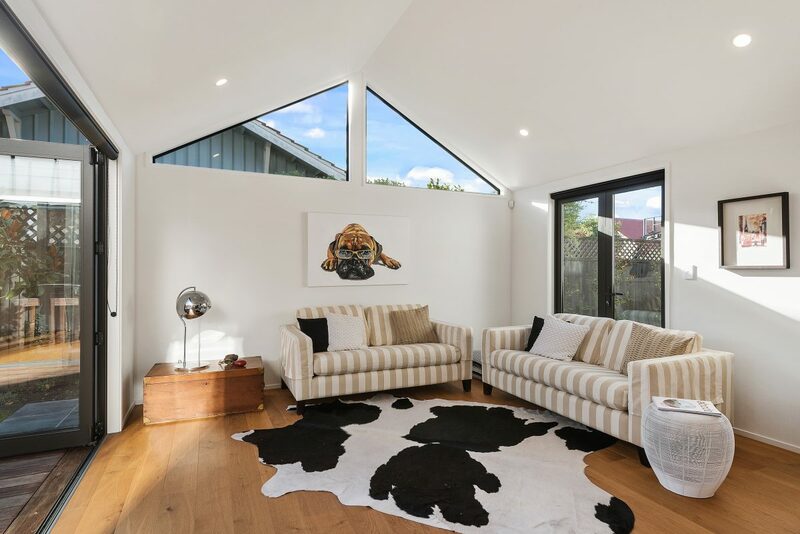 Our clients wanted to create a sanctuary from the hustle and bustle of the surrounding urban neighbourhood. 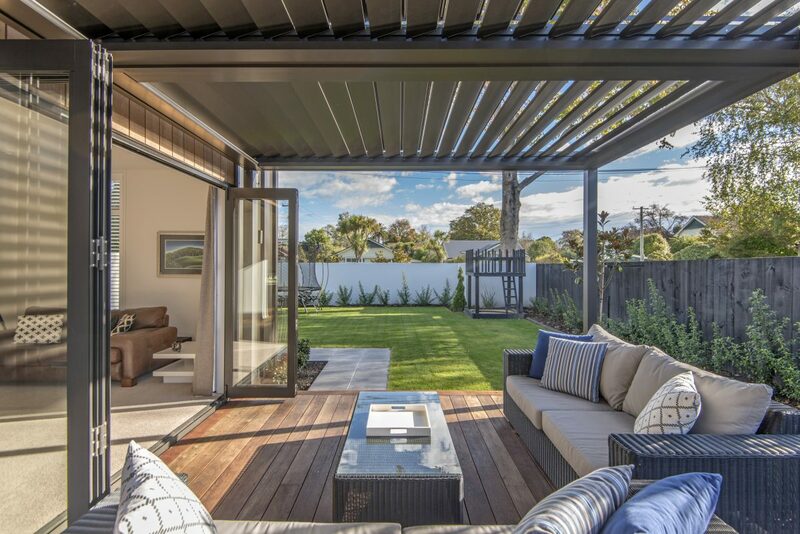 It was very important that we maximise the amount of natural light coming into the home, and create a peaceful outdoor living and garden area. Our landscape design incorporated the established trees, which was also important for our clients. 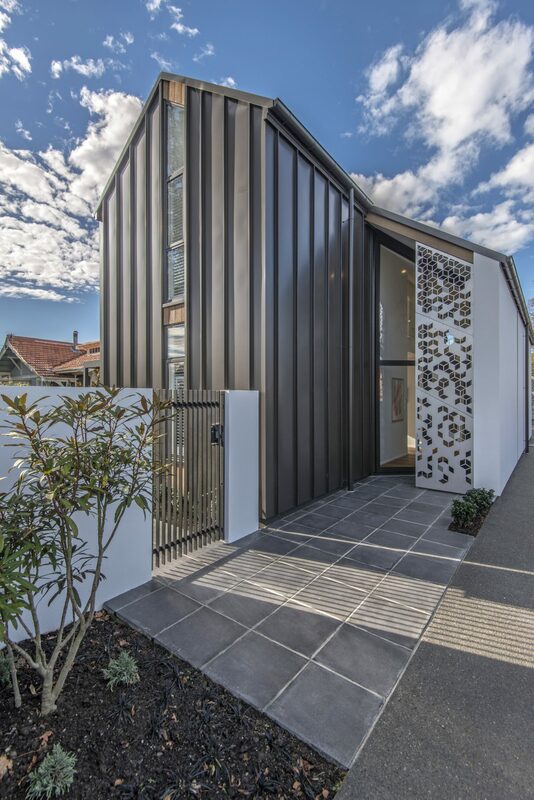 Anyone building a house in Christchurch after 2011 must place additional care and consideration on the foundations to future-proof the home against earthquakes. After geotech drilling and discussions with our engineer, we chose a Rib Raft slab instead of piling for the foundations. This innovative method of constructing concrete flooring means the foundations sit ‘on’ the ground, not ‘in’ the ground, making the entire house seismically stronger. Rib Raft slabs use polystyrene pods, steel reinforcing rods, plastic spacers and a special concrete recipe, which combine together simply to reduce the overall pouring time. 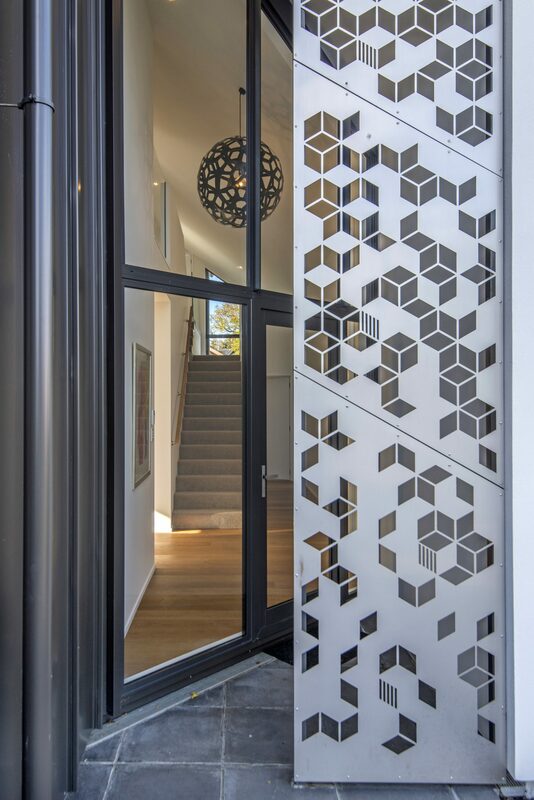 The bespoke cut-out panels that welcome you to the main entrance of this home serve a double purpose by maintaining the owners’ privacy from the street and creating a design feature. 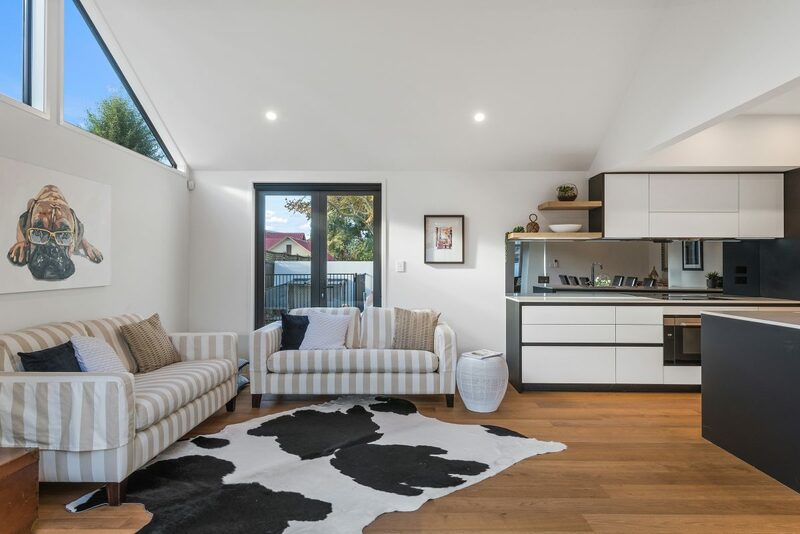 Designing and building sloping ceilings in the entranceway, living areas and master bedroom create the perception of a larger and more spacious home, which is enhanced by the ‘Resene Black White’ colour scheme for the ceilings and walls. 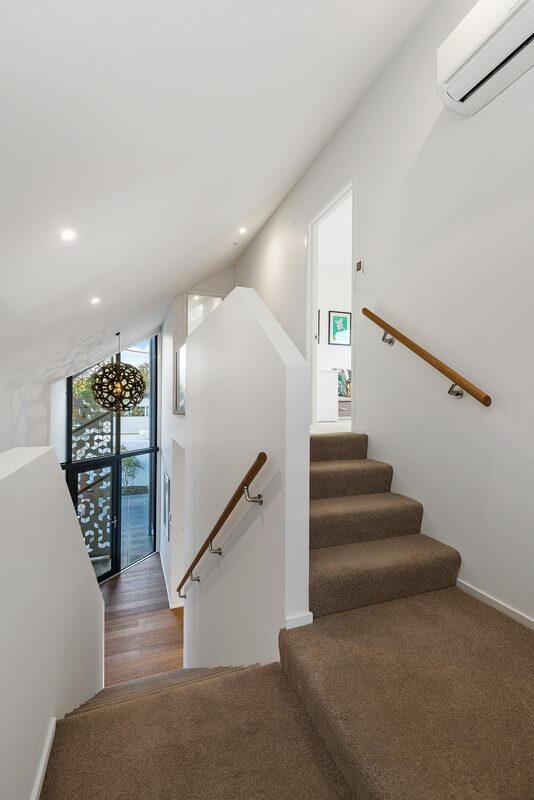 The gable height entrance, timber flooring and angled walls actively welcome you and draw you into the heart of the home. 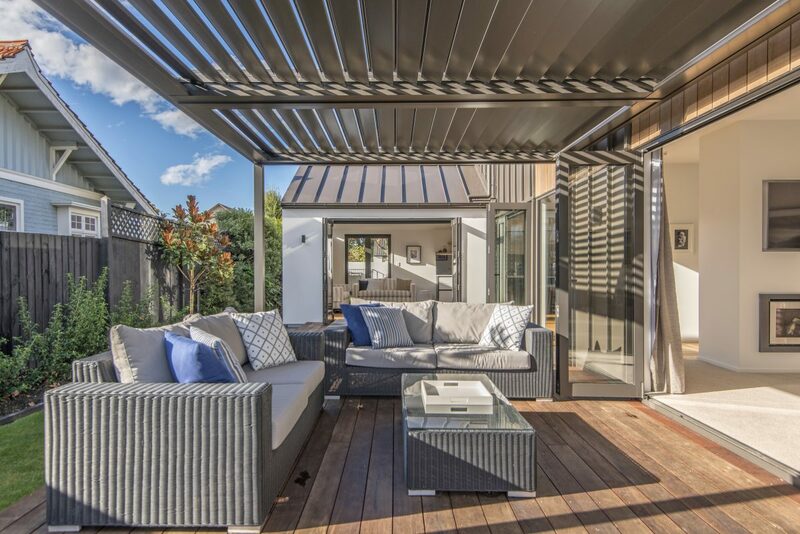 Our clients instantly fell in love with the northwest facing open-plan living/dining areas, which open onto a sheltered deck for the outdoor living that was so important to them. 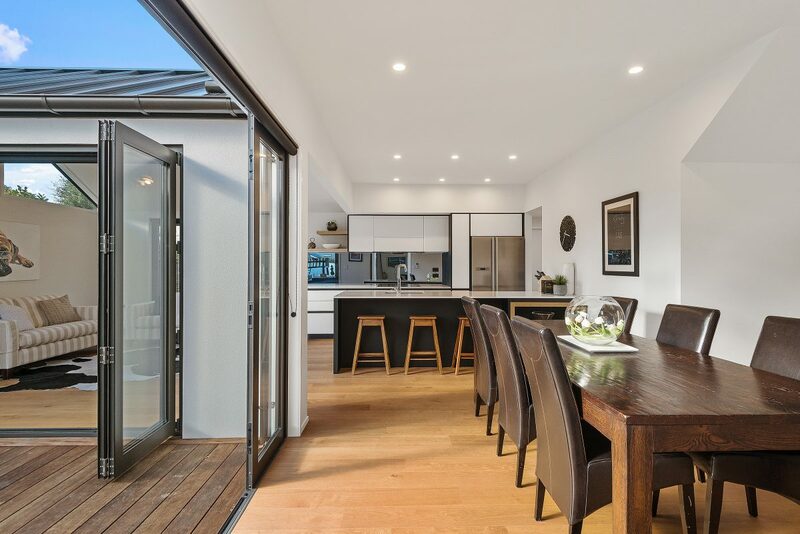 Perfect for entertaining large groups, or dinner parties with kids, we created a second living space with large bi-folding doors opening out to a sheltered outdoor living area, separate to the kitchen/dining area which also opens to the decking and garden. 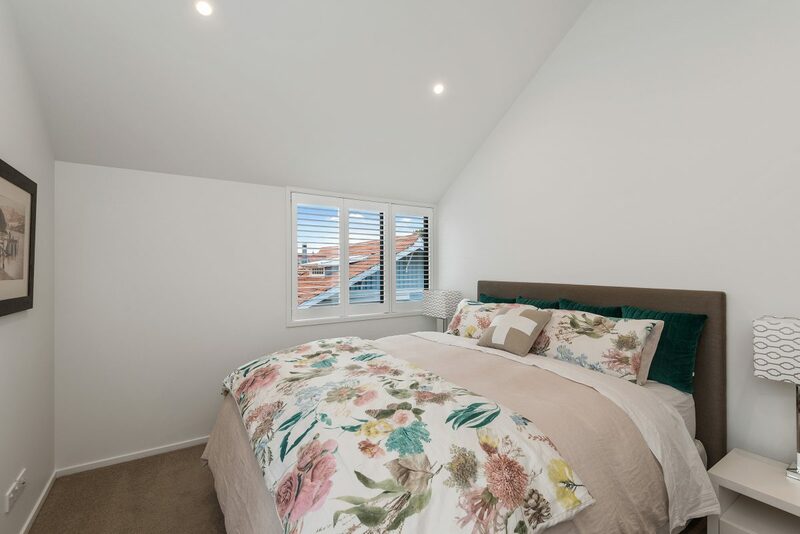 The master bedroom is a tranquil retreat with a walk-in wardrobe and a spacious tiled ensuite. Three further bedrooms share a second bathroom. 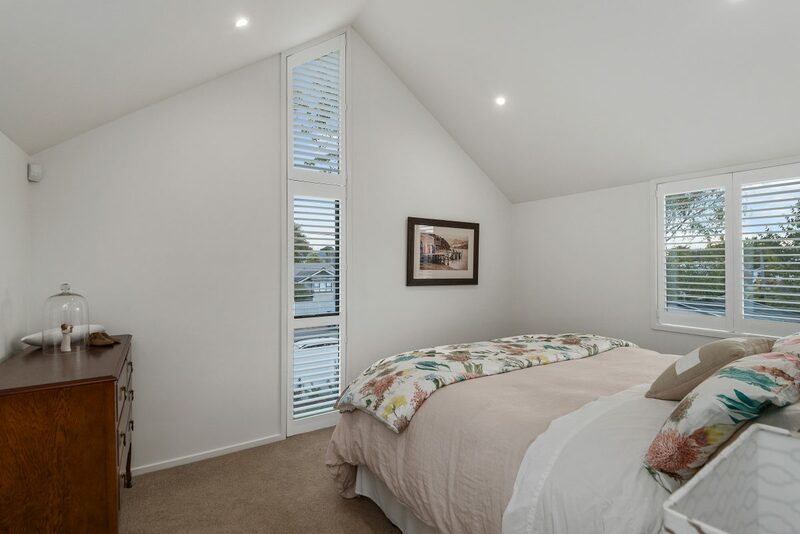 One of the downsides of a north facing house with large floor-to-ceiling windows is that living areas can become unbearably stuffy in hot Christchurch summers, and quite cold during the winter. 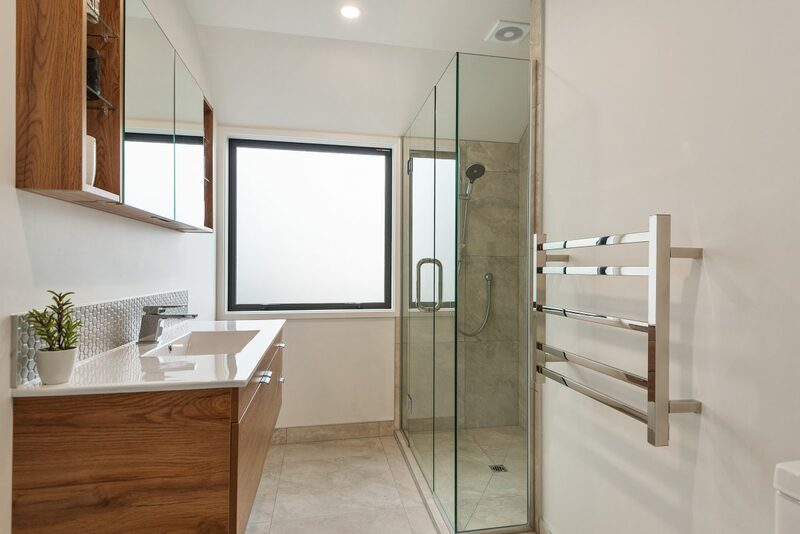 For this reason we suggested installing a ducted heating/cooling system which can redistribute warm air around the house to create a comfortable even temperature throughout the home. During winter, the same ducted system acts like a heat pump to keep the entire house warm. 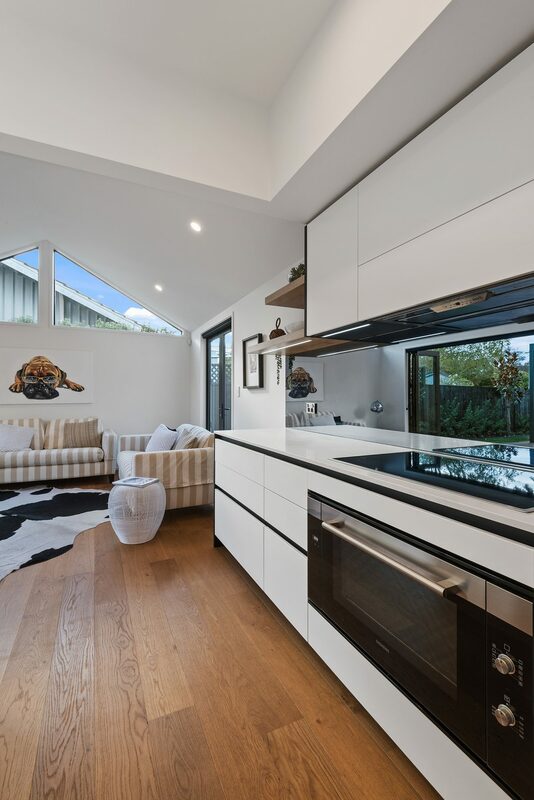 The sleek, open-plan, monochromatic kitchen decor ties with the rest of this modern Christchurch home. 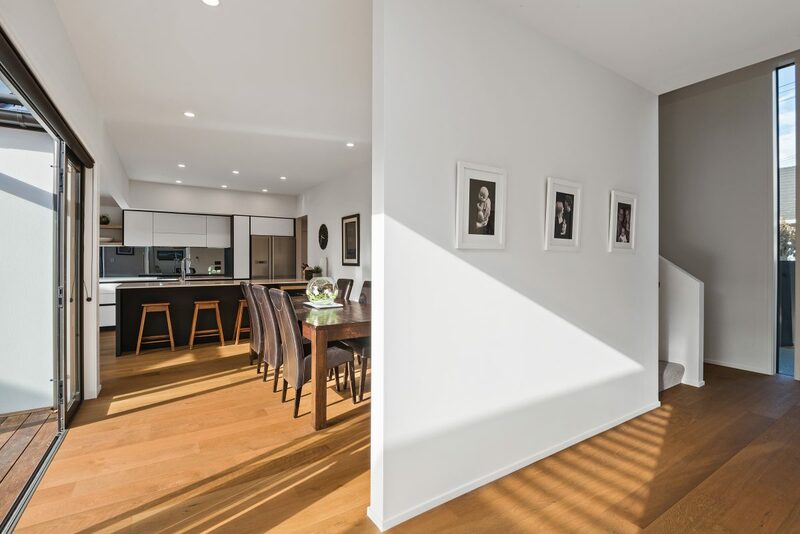 The timber accents match the flooring and help to create a more homely atmosphere. 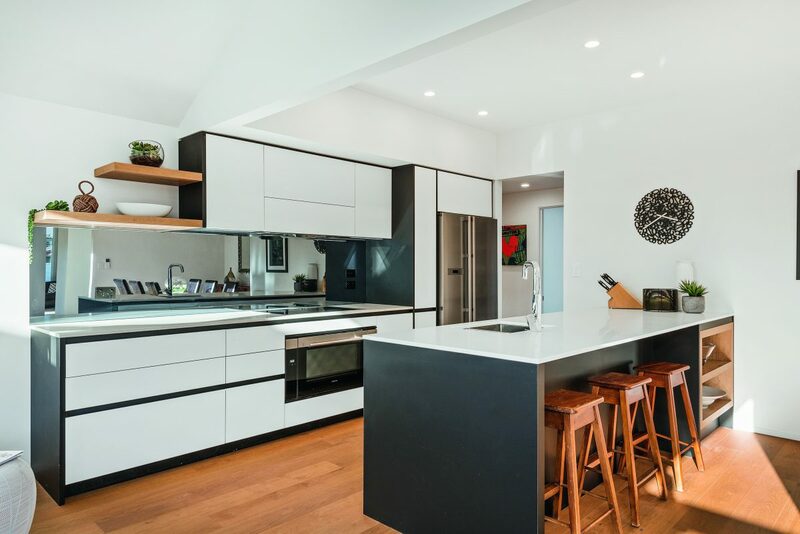 The handleless door fronts, soft-close drawers, and push to open mechanisms add to this kitchen’s modern feel, while maximising the available space around the workstations and the breakfast bar. 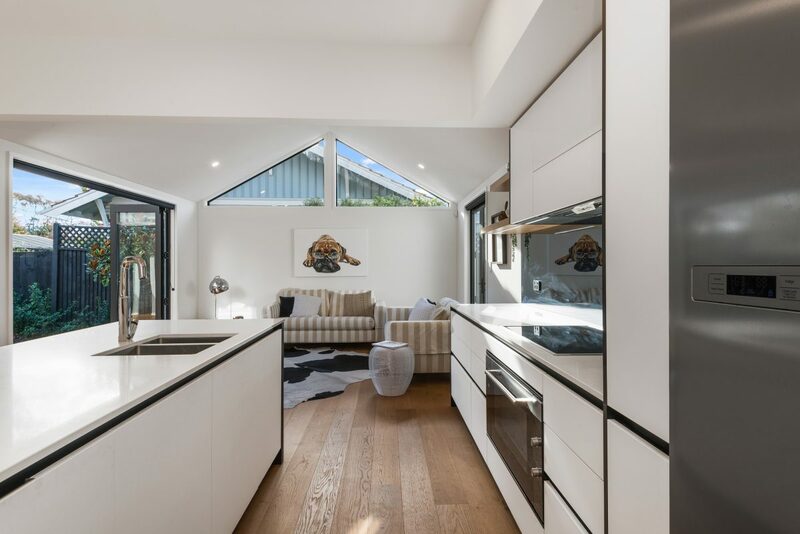 Every detail of this new kitchen has been addressed to create a beautiful, practical space for the owners who love entertaining guests. 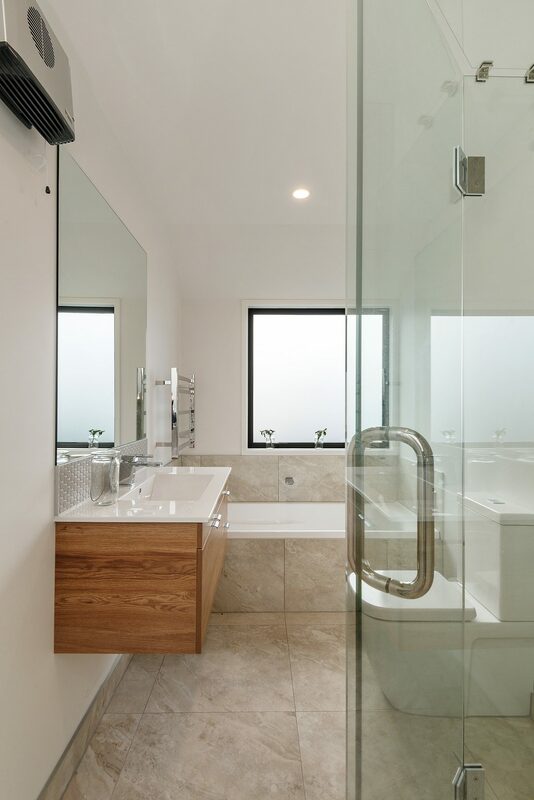 Every detail has been addressed to achieve a seamless look with sharp lines to optimise a light-filled space. Every member of the Fleetwood Construction team put a huge amount of care and passion into building this house, and we’re now proud to see it being loved as a family home. 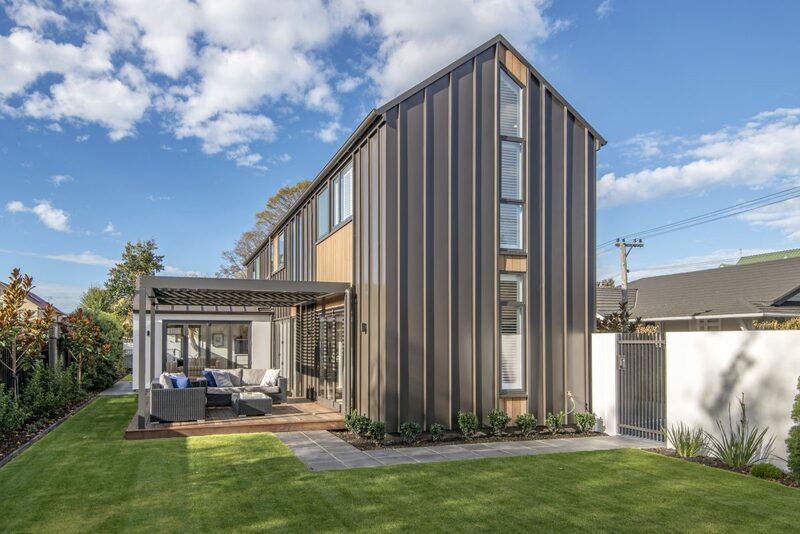 Are you building on a small-sized section in Christchurch city? 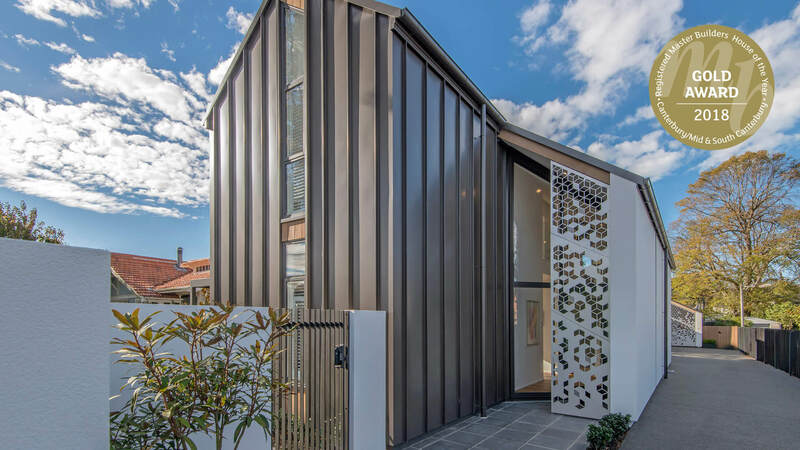 Are you inspired by this award-winning home and want to know more about smart designs and creating space? Contact the team at Fleetwood Construction for a free, no-obligation chat about your building ideas on 0800 381 381.